Today AMD is releasing a major feature update for Radeon Software in the form of the Crimson ReLive Edition 17.7.2 driver. AMD is calling this the biggest driver drop so far this year. Just to head this question off, AMD did not brief us on any Vega specific enhancements that may or may not be in this driver. The info that AMD gave us was purely on the enhancements they’ve made for existing RX 4xx and RX 5xx series customers. As of this driver drop all settings have been moved into the Radeon Settings UI and there is no longer a Radeon Additional Settings panel. 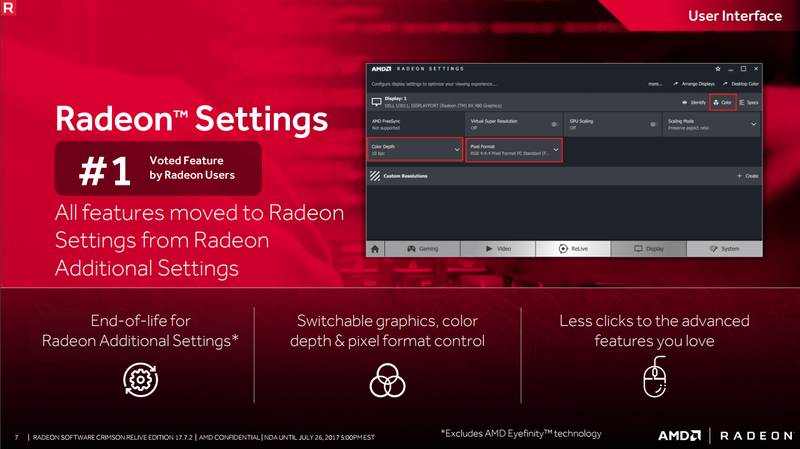 The controls for switchable graphics, color depth, and pixel format are inside of Radeon Settings now. AMD has made these controls available on a per display basis so that you use different settings for different panels. This is a nice, if simple change, that keeps the UI consistent through AMD’s Radeon Settings app. 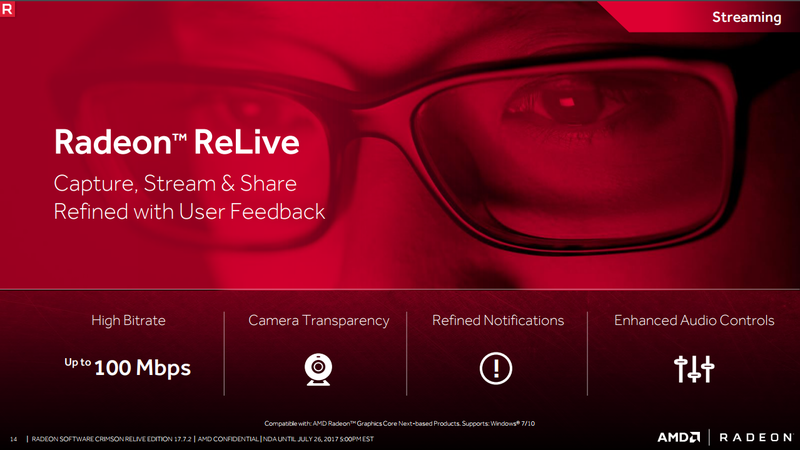 AMD has also made improvements to its ReLive screen recording app by doubling the maximum bitrate of recordings from 50 to 100 Mbps. They’ve also added optional transparency modes for when multiple stream are overlaid with each other. AMD then went on to reduced the performance hit associated with using ReLive to record game-play by about a 1/3rd thanks to optimizing the app’s memory usage. ReLive is becoming more verbose with this update. You’ll now receive notifications when ReLive is saving an instant replay, when you’re having networking issues, and for how long you’ve been recording. AMD has also enhanced ReLive’s audio controls allowing for different microphone volumes, a loudness boost feature, and toggle for enabling push to talk. ReLive won’t ever be a replacement for third-party apps like OBS, but then again it’s much easier to use. 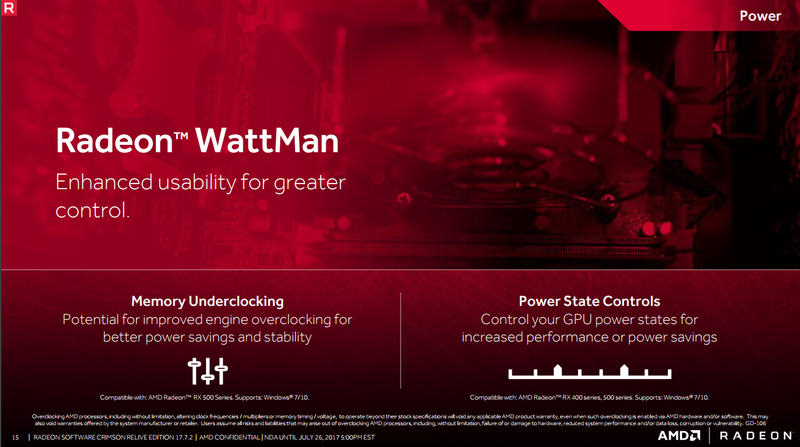 AMD is improving Radeon WattMan by enabling memory frequency underclocking and the ability to force the GPU to run specific P-States. Memory underclocking is a cool feature but I suspect the use cases for it are rather limited. Power State controls on the other hand will no doubt be an extremely useful tool for Radeon owners that are trying to troubleshoot the throttling bugs often occur with older games. With P-State controls you can force your GPU to perform at its best or if it’s acting weird to throttle all the way down to its minimum state. AMD is still working on its Radeon Chill feature which aims to reduce power consumption by dynamically capping framerates based on how much you’re moving in a game. 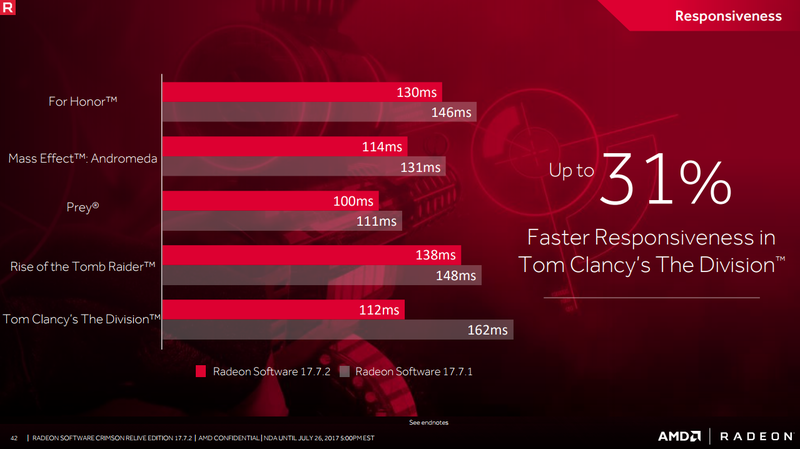 At launch Radeon Chill only supported 17 games; AMD has worked to expand that list by adding 22 more games. AMD has moved the Radeon Chill settings out of the WattMan menu and in the Graphics settings menu next to the Frame Rate Target Control options. This is a much better place for Radeon Chill as before it was rather buried inside of the Radeon Settings app. AMD has added the ability to select framerate minimums and maximums for the games where Radeon Chill is enabled. This is a nice touch for gamers with monitors that have greater than 60 Hz refresh rates. 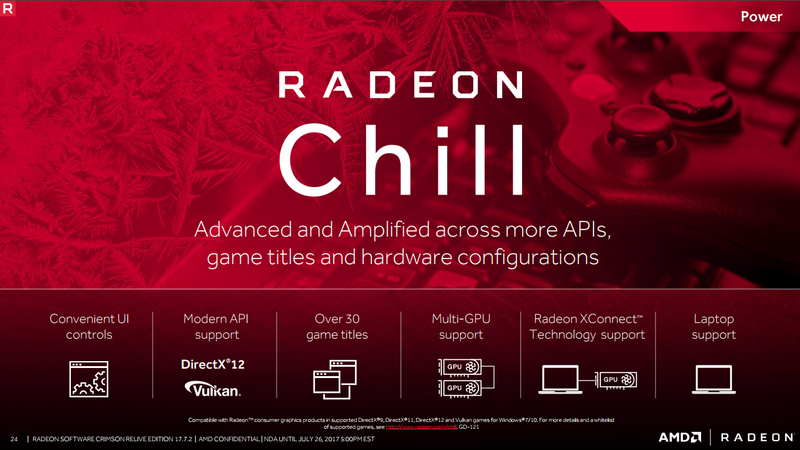 Chill can now be used on Multi-GPU systems and on external graphics solutions that use AMD Radeon XConnect technology. AMD is introducing a new feature they call Enhanced Vsync that aims to improve responsiveness and reduce stuttering in games compared to traditional Vsync. 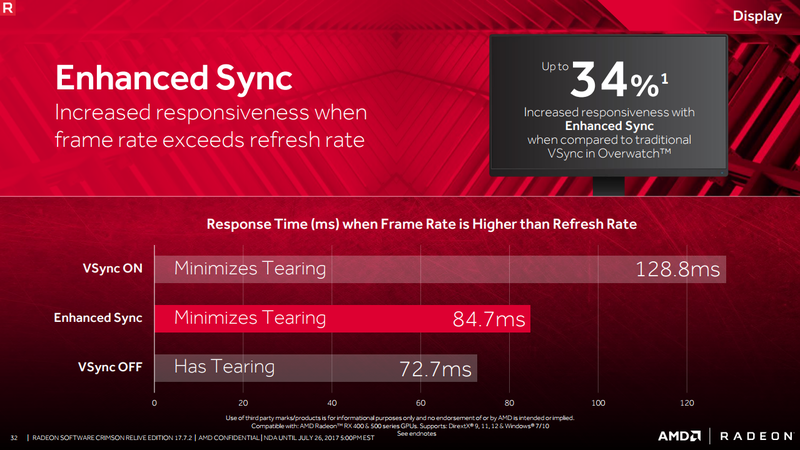 AMD’s enhanced Vsync offers all of the traditional benefits of Vsync but minimizes the latency hit and stuttering associated with normal Vsync. AMD is extending its Shader Caching feature to select DirectX 9 titles to reduce loading times by a few seconds in those games. Specifically they are highlighting 10% faster loading times in Starcraft 2. With the 17.7.2 release AMD has spent a lot time working on reducing latency between mouse movement and when you see the impact of those movements on your screen. To that end they’ve improved the responsiveness through application specific tuning in a number of games including For Honor, Prey, and Mass Effect. 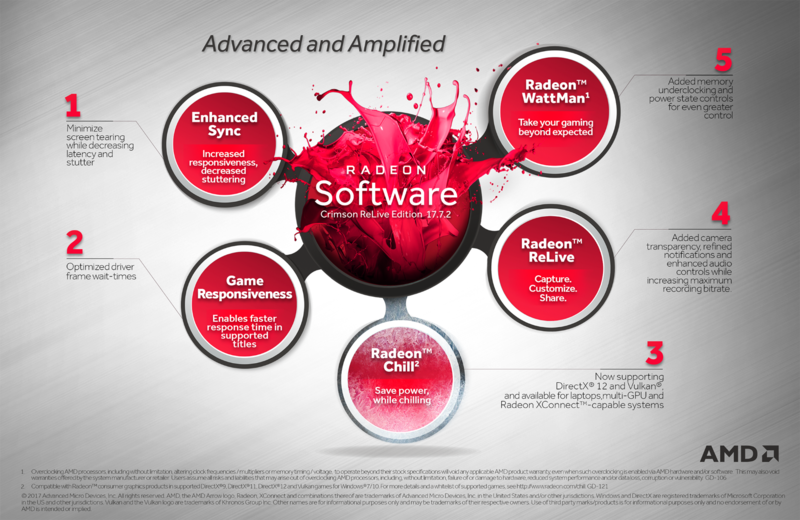 AMD is introducing a new beta testing program dubbed Radeon Software Vanguard. Where participants can get access to early builds of AMD’s upcoming drivers in a closed beta setting and directly submit feedback to AMD. For developers AMD’s is building on its LiquidVR SDK from last year with the AMD LiquidVR 360 SDK for VR Video Playback. This SDK enables smooth playback of 4k by 4k 360 degree videos on AMD hardware at 90 FPS without dropped frames and at lower power consumption level than what is achievable today. It also include support for up to six channels of spatial audio. 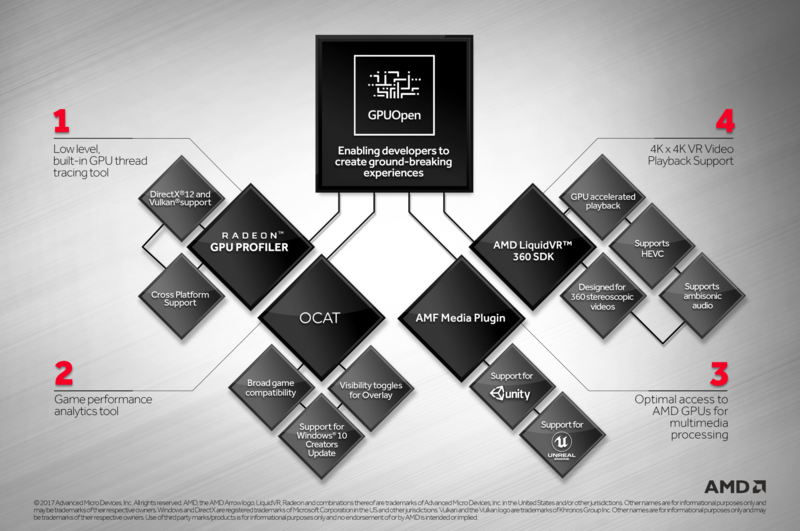 AMD is bringing these video playback improvements to the masses by offering what it calls the AMF Media Plugin to the Unity and Unreal Engines. With the Radeon GPU Profiler AMD is introducing a new tool to help game developers figure out how AMD’s GPUs are handling the workloads that their apps are creating. AMD’s new GPU Profiler is a major advancement over previous efforts thanks to the ability to trace hardware threads using hooks in the GCN ISA and display them in a concise way using wave front occupancy graphs. This tools supports Windows 7, 10, and Linux as well as both the Vulkan and DirectX 12 APIs. To support the use of its new Profiler AMD is releasing a special edition of its consumer driver with some extra debug features enabled. 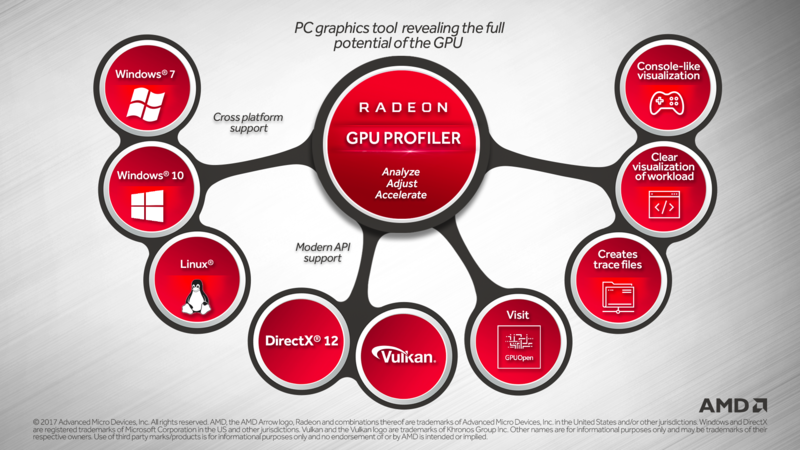 AMD calls this the Radeon Developer Driver and it offers the ability to create trace files for specific actions or workloads that devs can review using AMD GPU Profiler tool. AMD has seeded this tool to select developers and the initial feedback has been positive. All in all what we have is a solid set of feature updates to AMD’s Radeon Software. Conspicuously missing from this update is any discussion of Vega specific driver enhancements but given that RX Vega has yet to launch this absence is forgivable. For existing Radeon owners this update offers some mild performance improvements, some new configuration options, and enhancements to ReLive if that interests you. For developers this driver is a more significant step forward thanks to AMD’s LiquidVR 360 SDK, Radeon GPU Profiler, and Developer Driver.